Let’s learn about loud and soft sounds, high pitch and low pitch sounds with this lesson. We can group sounds as follows. The more energy the sound waves or vibrations have, the louder the sound you hear. If you play an instrument harder, it gives a loud sound. E.g. – When you hit a drum harder, the skin of the drum makes a large vibration and you hear a loud sound. If you stay close to an instrument which makes a sound, you can hear a loud sound from it. The less energy the sound waves or vibrations have, the softer the sound you hear. If you play an instrument lightly, it gives a soft sound. E.g. – When you hit a drum lightly, the skin of the drum makes a small vibration and you hear a soft sound. When you move away from a loud sound it becomes softer. The highness or lowness of a sound. What are high pitch sounds? When an object vibrates very fast it makes a high pitch sound. E.g. – A mouse can make a high squeak, because the sound made by the mouse vibrates very fast. What are low pitch sounds? When an object vibrates more slowly it makes a low pitch sound. E.g. – A cow makes a low sound when it moos, because the sound made by the cow vibrates very slowly. When do people make high and low pitch sounds? When they sing. When they play musical instruments. Do humans hear all sounds? No, humans don’t hear all sounds. What are the sounds that we cannot hear? Sounds which are too high. Sounds which are too low. E.g. – 1) We can’t hear the sound a dog whistle makes, but dogs can hear that sound. 2) Marine animals can often hear sounds that humans can’t hear. For example, we can hear whale songs only if very sensitive microphones are lowered into the water. What sounds that humans and animals can hear, depend on the frequency of the sound. Frequency means the number of cycles of sound in a second. 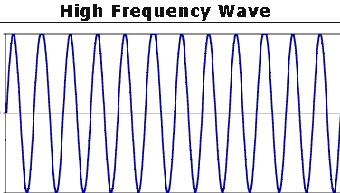 This high frequency wave has completed twelve cycles over the time shown. 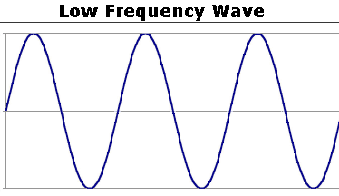 This low frequency wave has completed only three cycles over the same time. Humans can hear sounds at frequencies from about 20Hz to 20000Hz. Therefore humans cannot hear sounds below 20Hz and over 20000Hz. If sound waves hit a solid object, they may be reflected or bounce back. Then we hear the same sound again and again for few seconds. This is called an echo. E.g. – If you shout in a large empty room, like a big hall, your voice bounce all around the walls and ceilings and there may be lots of echoes. If there are so many echoes it is difficult to understand what someone is saying. What are the places where echoes can occur (take place)? How can we stop echoes? By lining the walls and the floors of the places where echoes can take place with something to soak up or absorb the sound waves. What are the things that we can use to absorb sound waves? Click here to learn more lessons on ‘sound’.